The top factor contributing to the death and poor survival of hair transplant grafts is desiccation, also known as ischemia or air drying. It is the leading cause of poor hair growth yield after hair transplant surgery. Hair follicles are exquisitely tiny structures. Therefore, the evaporation of even a small volume of fluid would have a far more detrimental effect on these hair growing structures, compared to larger organs such as the heart, kidneys or liver. Therefore, overcoming hair transplant poor growth due to dryness is an immensely important objective to address for protecting the integrity and functionality of extracted follicles. 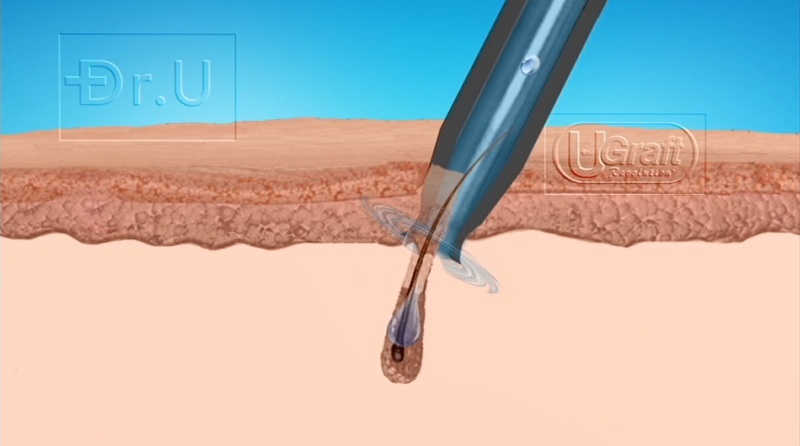 Dr.UGraft’s fluid integration system offers a tangible reliable system for consistently helping newly extracted follicles to stay hydrated during FUE scoring. It is also the only suction-free hair transplant technology in the world which offers this capability. Preventing air drying gives practitioners a greatly improved means for harvesting an abundant quantity of healthy, reliable grafts that can then thrive in the recipient area to produce the growth and coverage that patients count on. Damage inflicted on the hair follicles resulting from dryness can be very difficult to detect. Therefore, once they are implanted into the recipient area, problems with hair transplant poor growth due to dryness are not detected until the patient realizes that their hair transplant grafts did not grow. So at what point during the surgery is the follicular units most vulnerable to the effects of desiccation? There is a delicate window of time during follicular unit extraction after hair surgeon completely scores the grafts. It is when the grafts are then lifted from the donor region, isolated and then transferred into a physiologic fluid containing storage medium. FUE practitioners will routinely perform scores all at once by the hundreds. This process cuts the follicles off from their normal blood and fluid supply. In this time, the grafts are exposed to the element and would dry up if not pulled out quickly and stored in a physiologic storage medium. Due to the process of handling large volumes of grafts all at once, a significant amount of time can elapse before the follicles are able to receive hydration. And during this time, the grafts are the most vulnerable to the damaging effects of air drying. To date, only Dr.UGraft ™ technology has addressed this problem while avoiding the use of graft damaging suction devices. Grafts are stored in fluid media to prevent hair transplant poor growth due to dryness. Irrigation Mode: A 5-speed irrigation system that slowly drips a continuous flow of chilled physiologic solution to the tip of the punch. Hands- Free graft Ejection and Rescue Mode: This is activated at will by the provider who presses the foot pedal anytime a graft is impacted in the mouth of the punch. This action would cause a pulse of fluid to push a pin which moves forward to eject the impacted graft. Dr.UGraft’s fluid deposit system hydrates grafts as they are scored, preventing any risk of exposure to the drying effects of the air. It lubricates the inner punch wall and reduces friction between the graft and punch wall. The result of this is that the graft is less susceptible to torsion injury. This results when the top part of the graft impacts on the wall of the punch while the lower part is still held by scalp skin. The graft upper part continues to rotate with the punch twisting the graft until it breaks. Another benefit of this hydration/punch wall lubrication is that the friction generated by a rotating punch generates heat. This heat can result in micro-injury to the graft. 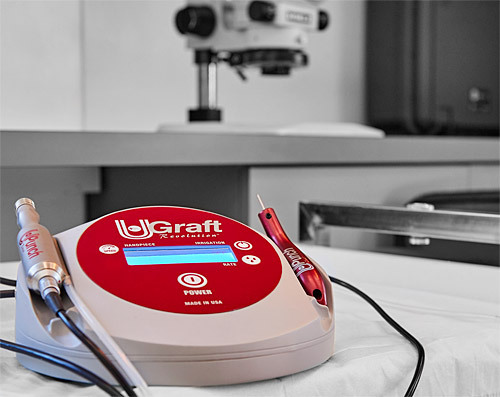 By minimizing the friction through lubrication and on account of the chilled nature of the fluid, the graft damage from heat is minimized by Dr.UGraft ™ system. The irrigation mode results in a film of fluid on the skin around the follicle. When the rotating tip of the punch circumference cups the skin on this film of fluid, a water seal is formed to enhance the ability of the punch to pull up the grafts gently. Furthermore, this fluid seal lubricates the tip of the punch thereby prolonging its lifespan. In linear scar free hair transplant that utilize punches, grafts would routinely impact the punch. Impacted grafts must be removed for the procedure to continue. Conventionally, the surgeon would have to stop the procedure and use forceps or even needles to try and pry out the grafts. Worse, if it is not retrievable, the graft can be sacrificed by being pushed in and crushed. The fluid ejection system of Dr.UGraft ™ solves this age-old problem by incorporating a fluid ejection system that is activated by simply pressing on a foot pedal. The graft is thus ejected in a sea of protective physiologic fluid. This hands-free graft rescue serves to make the process proceed seamlessly. More importantly, importantly the graft is rescued with enhanced survivability. The physiologic fluid made available by the Dr.UGraft Revolution™ console lubricates the inner punch surface to prevent graft impaction, torsional twisting of the graft and friction-induced heat. Watch the animated video below to see how this works. Dr.UGraft’s fluid system helps avoid the issue of transplanted hair not growing by minimizing injuries due to impaction and torsion. The fluid deposit system made possible by the Dr.UGraft central console works to create a vortex and a watertight seal. This further prevents air from coming in contact with the follicular unit graft. The vortex contributes to the upward ascent of the graft. This then strengthens the adhesion between the punch tip and the skin’s surface. Whereas hair growth and graft survivability are severely compromised with desiccated grafts, the opposite is true when the follicles are abundantly hydrated. Dr.UGraft ™ offers a viable technological approach to overcome hair transplant poor growth due to dryness. 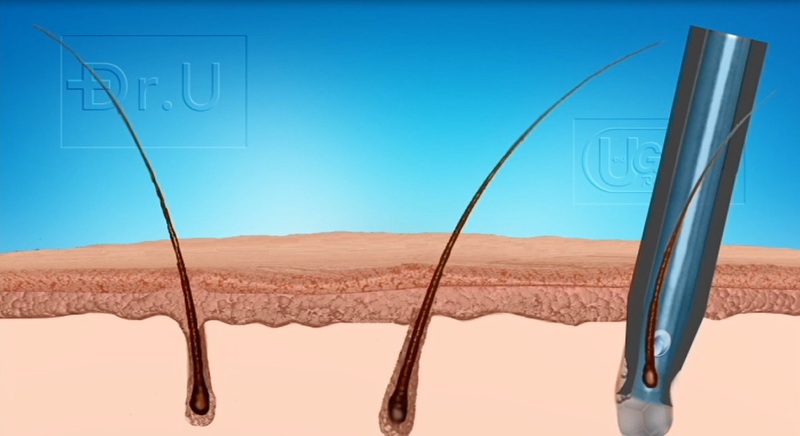 The Dr.UGraft ™ water irrigation system helps physicians and patients avoid hair transplant poor growth due to dryness by keeping grafts hydrated in every step of the procedure. Hydration contributes to bulkier grafts that are healthier and retain their ability to produce new hair. Although this has been long understood in conventional Follicular Unit Extraction practices, the incorporation of fluid has been restricted to the temporary holding vessel where grafts are stored until they are ready to be inserted into the recipient area. The Dr.UGraft ™ Revolution console offers a technological means to apply fluid hydration long before this point, right when the follicles are scored. This prevents air from coming in contact with the grafts. Furthermore, the convenience of a foot pedal control allows the necessary addition of life-sustaining fluid to become available instantly without disrupting the flow or ergonomics of the procedure. Dr.UGraft ™ offers an ergonomic, easy and practical solution for solving the issue of hair transplant poor growth due to dryness and even overcoming other FUE problems at the same time. Watch this video to see the Dr.UGraft rotary punch in action as it works to overcome the risk of graft dryness and the potential permanent damage that could result. Poor or low hair growth yield is undoubtedly a major concern for patients. Being able to prevent this occurrence requires identifying and understanding the exact cause. Dr.UGraft is engineered with the understanding that desiccation due to air drying is the leading factor responsible for transplanted hair not growing well, or at all, after surgery. As such, this technology is built to offer an easy, practical and effective solution to help practitioners prevent this problem. It is also able to attain healthier bulkier grafts that are well positioned to thrive long term. By introducing fluid while scoring, the Dr.UGraft ™ system avoids causing damage to the hair graft from friction (sometimes referred to as “heat burn”). This damage is a micro-injury that can affect the survival of the graft in the transplanted area, therefore affecting hair graft growth after transplant. With the continuous lubrication of the punch through fluid integration, Dr.UGraft™ avoids this source of harm to the graft and thus avoids poor growth due to this injury. 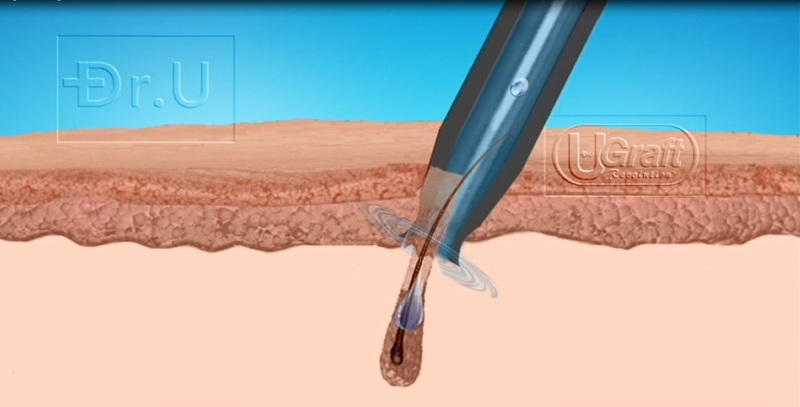 The Dr.UGraft ™ fluid integration system, designed to preserve and increase graft health, also has the effect of creating a fluid seal around the graft. When the punch is aligned over the hair follicle during extraction, fluid continuously drips. This means that that at the moment of scoring around the follicle, the fluid fills the space between the surrounding tissue and the graft. This is referred to as a fluid seal. The surrounding fluid helps gently pull the graft out away from its anchoring attachments. This hands-free graft rescue feature thus allows physicians to move on with scoring grafts in quick succession without having to either stop and pluck the impacted graft out of the punch, or to bury and thus destroy the graft by continuing with extraction while it remains in the punch. The convenience of this foot-pedal controlled action benefits the practitioner’s medical personnel as well since procedures do not have to come to a halt in order to free grafts from the punch. Start the process of becoming a Dr.UGraft ™ provider. Does transplant hair grow if exposed to air? Grafts exposed to air after being cut off from the patient’s blood supply are immediately at risk of desiccation. This lowers the chance of the graft’s survival in the recipient area during the implantation phase of surgery. The is the most common cause of transplanted hair not growing after follicular unit extraction procedures. The Dr.UGraft™ hydration system decreases this risk significantly by introducing physiological fluid to the graft from the moment of extraction. With the continuous irrigation system, this fluid hydrates grafts while separating it from the surrounding tissue. This ensures increased odds of survival. After a hair transplant when will hair grow? Is a hair transplant growing slowly due to dryness? The complete results of a hair transplant can take up to 18 months to grow in. Patients typically see new growth four months after the procedure. Beyond this general time frame, if a patient notices hair transplant growing slowly, graft failure due to dryness may be the culprit. Besides air exposure, what are other common sources of graft damage during FUE procedures? In addition to air exposure, mechanical injuries due to human error constitute another common form of damage during an FUE surgery. This includes torsion or twisting of hair follicle structures that accidentally become impacted inside the punch. Also, once inside and left undetected or unaddressed, impacted follicles leave no room for new grafts. As a result, continued attempts to extract will likely crush, sever or bury follicles. Punch misalignment creates another type of damage as practitioners rely on guessing to determine the location of the grafts. Human error within this context can lead to severing the follicles due to inaccurate estimations. Does the Dr.UGraft Revolution Fluid irrigation console work with all Dr.UGraft devices? The Dr.UGraft™ Revolution console can be attached to Dr.UGraft ™ devices like the Dr.UPunch i, ™ and the Dr.UPunch Curl ™ to provide fluid hydration and the ability to eject impacted grafts through the use of fluid irrigation.